I thought I would never say this, but I really want to. They say it's all in the smile. You think so? Mum has been gone for almost a week now to Melbourne, Australia to look after my little newborn nephew, Tristan for 3 months. And the house has been a wrecked. Well not entirely but soon! I know every teen gets excited when their parents are out of town and what not. Truthfully, there's the pros and cons to it. Pros: You get your freedom, duh. And of course, the great escapes from nagging. Cons: Everything is just wrong. No one to feed my dad, brother and I. No one to wash my massive amount of laundry. No one to clean the house. No one to complain to when my brother bullies me. 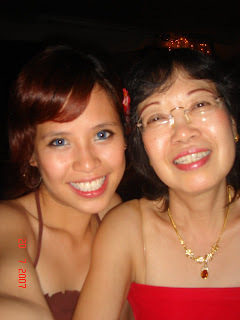 Aiyo...I just miss my mama. But you know what? After all that has happened with the household stuff. I became really independent and more responsible. Not that I'm not. But I guess, I took my mother for granted. So the past week, I cooked for the men in the house! And so far, dinner has been good, says my dad. As for my brother, he practically consumes anything. So no complaints there. Yours truly can officially cook a decent meal. Care to try some? So Mum has left the building. Dad is leaving soon to down under too. Don't know exactly when. But right now, I just got to save! Save a lot of money! Petrol, food, petrol, food. (sigh) The thought of it already scares me. I'm such a muka tebal person. (laughs) Been asking people to take me into their families when my dad leaves. Will anyone house a parent-less child? I just need food (both lunch and dinner, would be great. Get to save a few ringgit there!) and someone to do my laundry! Shelter? I still have my room. Oh yes, petrol. BAH! Don't think I can save on that. My only mode of transportation is my much-relied-on car. Unlessssssss...could you give me a ride? Alicia stop being a brat. It's not as if it's my first time living home alone. In fact, living alone is uber fun. I get the whole house to myself. The tivo is just for me. And I get to walk around the house in my undies (grins). Anyway, back to my whole point of this post.